Use Creativity In All Parts Of Your Crafting! Almost everyone has wax paper laying around in your pantry. Have you ever considered all its uses? I was looking for an Easter party favor to give to my neighbor. I found one I liked on a website but realized my ink cartridge was low on my printer. 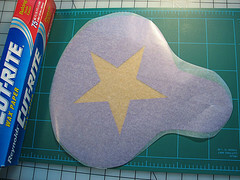 I then thought of using waxed paper to trace the craft patten directly after taping the waxed paper to the screen. I then traced with a sharpie and cut it out.